In order to keep your home cozy, warm, and hassle-free during the wintertime, it’s necessary to spend a little time and effort now to get it ready for the changing seasons. This can also help to ensure that you won’t have any surprises to deal with come next spring. But that doesn’t just mean putting the garden equipment and BBQ away. Getting your exterior geared up for the onslaught of freezing temperatures and snow storms requires more work than that. To get your home prepped, here are some of the most important fall maintenance tasks for your home’s exterior. According to lawn care experts, this time of year is ideal for fertilizing your lawn before it gets pummeled with snow during the winter. Fertilizer gives the roots of the grass the nutrients that it needs to survive during the winter weather. Ask your lawn care expert at your local garden centre to recommend a fertilizer suitable for the fall season. We know it’s a pain to think about, but cleaning out the eavestroughs is one of the most important tasks to do before the winter arrives. Your gutter system plays an important role in protecting your home from water damage. 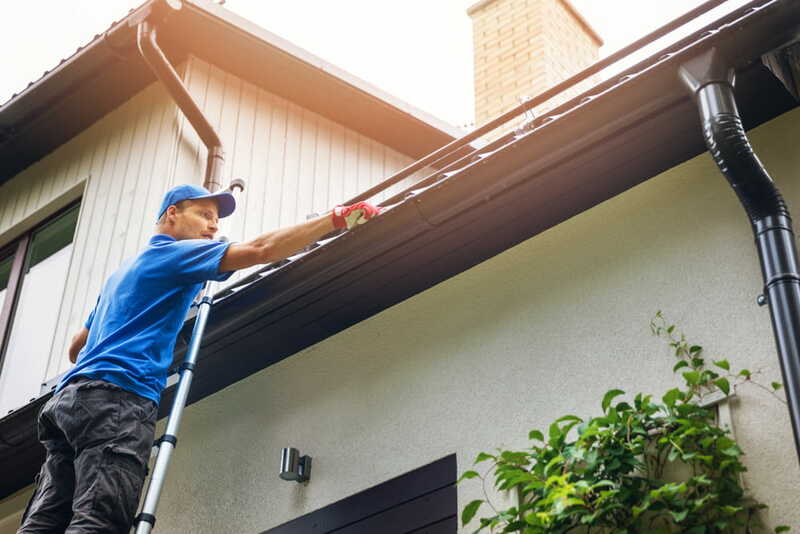 But if the gutters are clogged up with the leftover debris from the fall season, then all of the accumulated moisture will pool either on your roof or near the foundation of your home. So make sure to grab a friend and a ladder or hire someone to do it for you in order to safeguard your home from leaks and flooding. If you have a custom deck or wooden fence, now’s the time to apply a sealant or stain to protect it against moisture damage. Without a proper seal, moisture from the winter can weaken the wood fibres and even create mould and mildew growth. Before the first snowfall arrives, we recommend raking up any leaves in and around your landscape. Letting the leaves linger on your grass can inhibit the growth and survival of it once the springtime arrives. Plus, any small trees and shrubs should be pruned and wrapped to protect them against the harsh weather. Don’t forget to protect your pipes from freezing! Spending a few moments draining any outdoor faucets like your hose, can save you a lot of aggravation later on. When you’re ready to tackle the fall maintenance tasks for your home’s exterior, make sure to tick off these five items so you can rest easy and feel confident that your home is buttoned up well for the winter.